JERSEY CITY – Fresh off setting the Guinness Book of World Records for the “largest spray paint mural by a team” with his Rio 2016 Olympic Games-inspired “Ethnicities,” internationally-renowned, Brazilian street artist Eduardo Kobra is bringing his unique vision and talent to Jersey City. Widely known simply as Kobra, the sought-after artist has begun work on a 180-foot tall mural on the façade of 837 Jersey Avenue in downtown Jersey City. 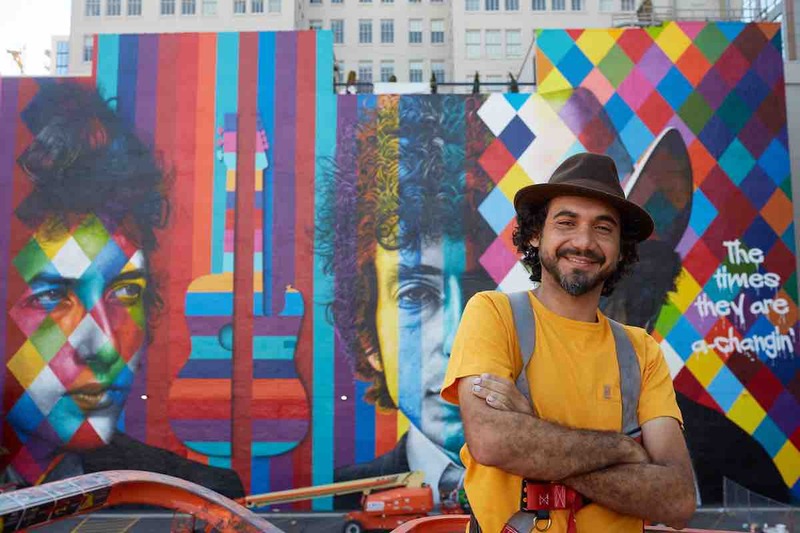 Kobra, whose murals of notable historical figures include Gandhi, Abraham Lincoln, Bob Dylan, Nelson Mandela, and John Lennon, are painted utilizing bright colors and bold lines while incorporating a kaleidoscope theme. Much of Kobra’s work represents fraternity, respect for the other cultures and acceptance and love for differences, which was one of the reasons he was approached for the Jersey City Mural Art Program that is rooted in the city’s diversity. Kobra has worked in more than 20 countries and created more than 30 projects in the United States alone, with murals in London, Athens, Lyon, Los Angeles and New York. Expected to take approximately two weeks to complete, the new mural will be an exciting addition to the more than 86 other public works of art created throughout the city by local and international artists in the past three years as part of the city’s flourishing Mural Arts Program. “It’s great to see that Jersey City has embraced street art through its mural program and I’m very happy to be a part of it,” said Kobra. Launched in 2013 by Mayor Steven Fulop to foster arts and cultural awareness, the Mural Arts Program has effectively transformed the City into an outdoor gallery through the creative works of local, national and international street artists, including Shepard Fairey, Pixel Pancho, Karski & Beyond, Fintan McGee, Faith47, and WK Interact, and local artists Mustart, Fermin Mendoza, Lissanne Lake and Catherine Hart. The new installation is taking place during Jersey City’s Annual ARTober festivities that kicked off with the 26th Annual Jersey City Art and Studio Tour (JCAST), a city-wide showcase of the arts featuring nearly 1,000 participating artists in hundreds of venues that include private studios, galleries, local businesses, and pop-up and public spaces. To further integrate the Kobra mural into the local Jersey City art celebration – which runs through the end of October, – a 10,000-square-foot pop-up gallery has opened in the 17th Street retail space of the Cast Iron Lofts building that displays a collection of works from nearly half of the participating artists in Jersey City’s Mural Arts Program. Entitled “OUTSIDE/in,” the gallery features more than 85 pieces of visual artwork from acclaimed mural artists such as Distort, Emilio Florentine, Hell Bent, John T. Ruddy, Pawn and many others. The exhibition also includes indoor murals and large-scale installations, and is open to the public every Saturday in October from 12pm to 4pm. The Kobra mural and “OUTSIDE/in” exhibit reflect Jersey City’s emergence as an important art and cultural destination that attracts the creative class. The Mural Arts Program has commissioned works that support local art and beautify neighborhoods by programming public spaces with outdoor paintings that deter graffiti and incorporate the cultural and historical aspects of different neighborhoods. Jersey City’s Mural Arts program has been compared to those in Brooklyn, Los Angeles, Detroit and Miami’s Wynwood neighborhood. The Kobra mural, and others like it in Jersey City, offer accessible, authentic artwork that can help enhance and re-energize neighborhoods through creativity and aesthetic beauty.